Prov. West of England Academy, Harrison Cowley Award 1967. 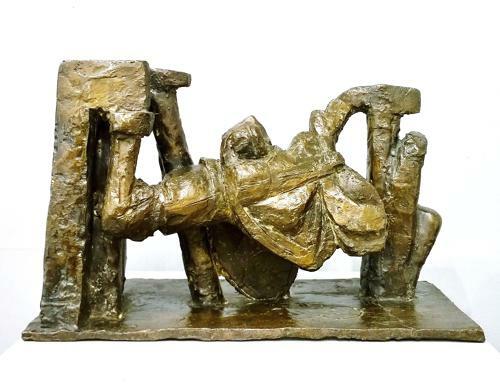 Carl Plackman was one of the most influential sculptors of the late twentieth century, he has been called, ‘the godfather of British conceptual art’, being one of the most innovative and challenging sculptors of his day. He created complex works which questioned what sculpture could be. As a teacher at Goldsmiths Collage his students have become major names in British contemporary art, Tony Cragg, Damien Hirst and Alison Wilding. His own work has been exhibited in the UK and internationally with works in the collection of the Tate, Henry Moore Institute, Arts Council, British Museum, V&A, Courtauld and Art Gallery of NSW Sydney, Australia and others. 1959-1960 - Apprentice architect, Bath. 1962-1967 - West of England Collage of Art, studied under Paul Feiler along with fellow student Richard Long. 1967-1970- Royal Collage of Art. studied under Bernard Meadows and Ralph Brown. 1970- 1999 – Taught at Goldsmiths College, London. ‘Figure in Human Form, 1967, won the Harrison Cowley Award at the West of England Collage of Art.